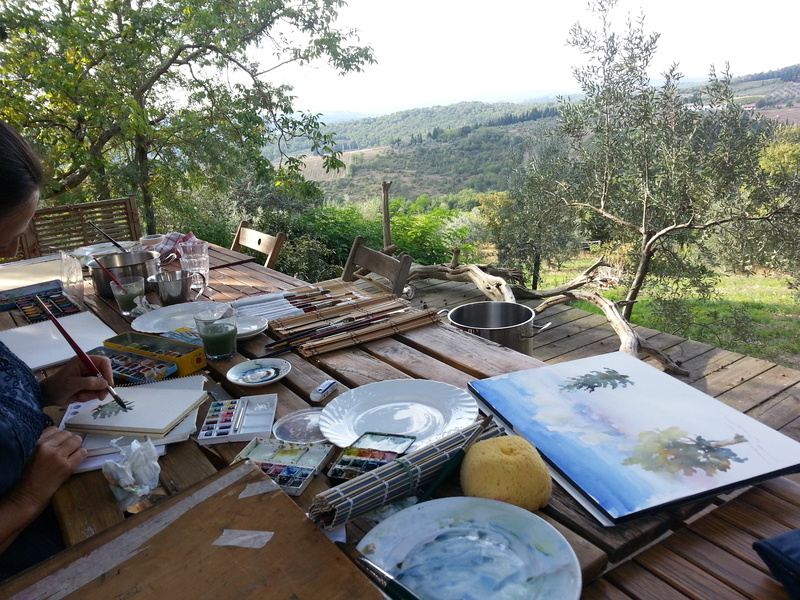 Painting residential workshops in Tuscany: challange your talent, learn new techniques and experience Tuscany art and conviviality. 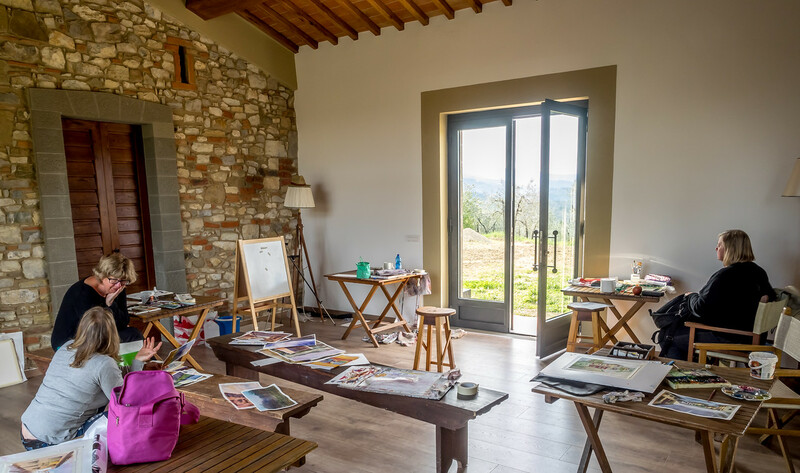 An unforgettable experience in the middle of the Tuscany countryside: feel the pleasure of drawing and painting in a charming hilltop retreat in Chianti, challange your talent and indulge yourself with inmost regenerating moments in contact with positive energy, silence and nature. 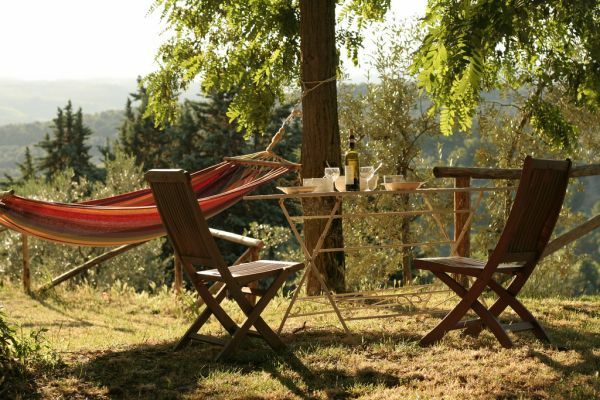 You will live a memorable intensive art learning in Tuscany not forgetting local exploration and good local food and wine for an authentic and creative holiday in Chianti. The workshop tutors are expert painting teachers who run sucessful workshops internationally. The lessons will held in the studio or in open air, in English or other European languages. The studio is at disposal for extra session of work in the morning and in the evening. The typical workshop day will begin with a tasteful and convivial breakfast on the terrace with home baked cakes and local specialities. Later the group will meet in the studio for a presentation of the day's art programme and then the morning painting session will start. At midday lunch will be served with fresh local produce and after a short break the afternoon session will continue untill evening. Programms may vary and offer visits and sketching sessions to art cities as Florence, to local villages and markets and one free day for personal art research, walks or relaxation. A typical traditional Tuscan dinner will be served in the evening and the group may continue in the studio the review of the day's works and introduction to the next day lesson. Watercolour painting tutoring. Lessons will be en plein air or in the studio. ASK NOW! Watercolour and Acrylic painting tutoring. Lessons will be en plein air or in the studio. ASK NOW! JOIN OUR RESIDENTIAL ART WORKSHOPS: LEARN, ENJOY, HAVE FUN! 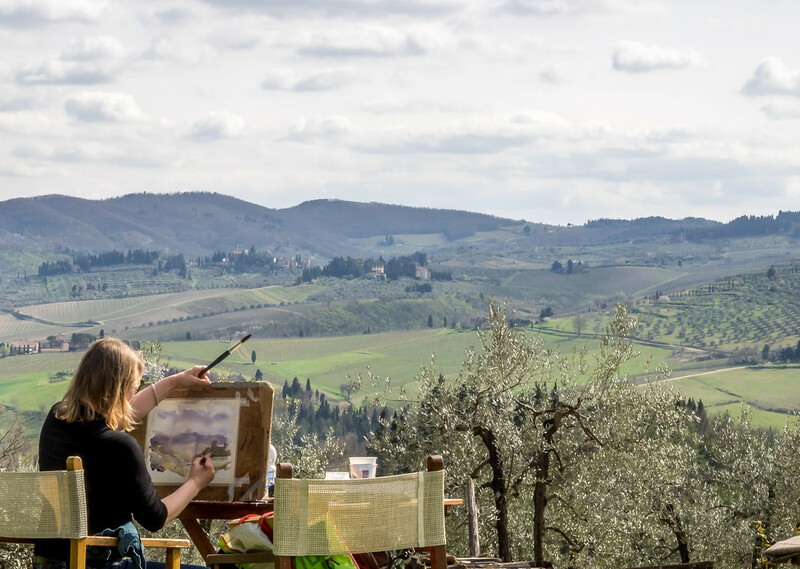 Chianti is one of the best places in Tuscany for experiencing an art day or a painting course during a short break immersed in beautiful landscape. 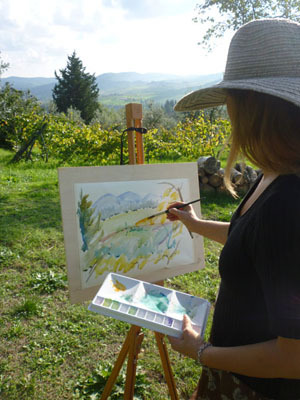 Even just a half-day of painting experience in Tuscany or a full immersion painting short break will lead you into the wonderful world of watercolour and acrylic painting surrounded by the beauty of Tuscany views. Lessons may be individual, one-to-one or in small group for beginners and/or more experienced students held by our expert resident teacher. The program will be arranged according to the level and the expectations of the students in drawing, sketching, watercolour and acrylic painting. Specific programs for families and small groups. One painting at least will be completed. Basic material is provided. More specific art material can be provided on request. More details about programmes here: PRIVATE PAINTING COURSE.